Eugenie C. Scott has been named one of the Scientific American 10, a select group of leaders in science, politics, business, and philanthropy, who are building a better future with their ingenious approaches to solving global problems. Scott, the author of Evolution vs. Creationism, is the executive director of the National Center for Science Education (NCSE), a nonprofit organization that seeks to keep evolution in the school curriculum, and to provide resources and accurate information about the evolution / creationism controversy. 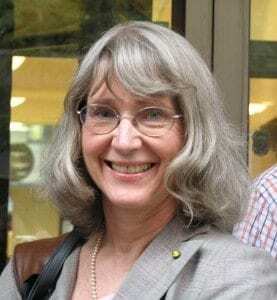 Scientific American praised Scott’s longstanding advocacy for this cause, noting that she calls herself “Darwin’s golden retriever” for her enthusiastic and committed defense of evolutionary science. Under her leadership, the NCSE has been instrumental to to promoting public understanding of science, and in the struggle to keep evolution in the classroom. This year, Scott also received the first annual Stephen Jay Gould prize from the Society for the Study of Evolution. Read more about Eugenie Scott, and learn how the other Scientific American 10, including stem cell biologist Andras Nagy, Intel environmental manager Todd Brady, physician Wafaa El-Sadr, anti-smoking activists Bill Gates and Michael Bloomberg, President Barack Obama, and other innovators, are changing the world.